Nothing to do with running, I know, but clearly a more important issue than my Half marathon prep. Just the threat of sequestration has already cost thousands of private sector jobs. Yes, PRIVATE sector...government contractors are employed by private companies: Boeing and SAIC and General Dynamics, plus thousands of small businesses around the country. If you don't think loss of private sector jobs impacts everyone, you are very wrong. No matter how you feel about the government and politics, or where you personally place the blame, only Congress can fix this. As the law stands right now, of the required $1.2 TRILLION in cuts over nine years, There are some assumed savings in the law, but it boils down to about $109 BILLION being cut every fiscal year. Unfortunately, there are only seven months left in Fiscal Year 2013 when sequestration hits (March 1st - September 30th). Half of these cuts will come from Defense, the rest will come from domestic spending (excluding Soc Security and some parts of Medicare). That impacts welfare, housing assistance, health care programs, some student financial aid programs. That means furloughs for government workers and more private sector people out of jobs. The law does not allow much room for discretion within the federal agencies because the projected cuts are so draconian. It's like amputating both legs to cure a fungal toe this year...and forgetting to stitch up the wounds for the next eight years. I know that's gross, but it's that bad. Remember sequestration was designed to be so ridiculously repugnant to both Democrats and Republicans that it would force the two parties to work together to reduce the defict. Well...they failed. 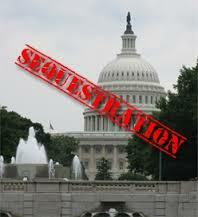 Preventing sequestration from occurring will take cooperation and compromise. We cannot afford for Congress to stand on ideology and allow our still fragile economy to completely tank. Please write your congressmen to tell them you are holding them responsible for that failure. If you let Congress know that you care, they will work harder on this issue. They want to be re-elected after all. For a more reputable source of info on this topic, you can read this 2012 article from the Washington Post.